Do you know what a Munzee is? Well, we think it's a way to add a bit of extra fun for kids when we're out and about. A Munzee is a QR code that can be read by a smart phone and they are all over the place to find in a tech age scavenger hunt. The QR Codes are printed out and can be stuck on signs, buildings, fences, trees and all kinds of other places. They can be hidden inside containers, or printed on objects or stickers. There's a Munzee app for iOS and Android which you can use to find Munzees and scan them to record your discovery. We've just had lots of fun with family who are avid Munzee hunters. Image: My younger son has found it! In this case the Munzee is a small sticker on a fence. We've been geocaching for a long time and Munzee hunting is a simpler version that's version quicker to do and you don't need to have items with you to swap when you find a Munzee like you do with a lot of caches. There are also points and game elements which add some extra fun. But for young kids it's just fun to find things. 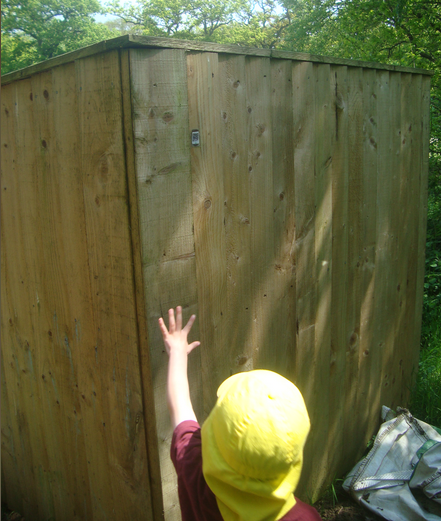 As with geo-caching Munzees are a great way to encourage kids to get outdoors, walk a bit further than they would normally and explorer their environment in more details. If you let them take charge of the smart phone they can also learn about about maps, directions and tracking. Here's the trailer which explains how Munzee hunting works. There's a corporate marketing aspect to Munzee too and I can see how this can be used with kids. It's a good way to add an extra element to a family venue like a nature park or museum. It's also a good way to get kids asking their parents to visit places because they need another Munzee for their collection. You can even set your own Munzees. Put them in places you like to visit for an added incentive to get out and about and check that they are still intact. Definitely a fun and high-tech way to get outdoors more with kids.